These Peanut Butter Butterscotch cookies may have changed my life forever, no joke. It all started a couple weeks ago when Amanda and I were cruising around San Diego and popped into the famous “Spread” Restaurant. It has been featured on The Best Thing I Ever Ate on Food Network and now I completely see why! They specialize in making their own creative gourmet peanut butter spreads that are beyond your wildest imagination 🙂 I would never believed it until I took my first spoonful. It was all over from there. I chose the butterscotch gourmet peanut butter spread and the white chocolate pretzel….swoon! Start by melting butterscotch chips over a double broiler until melted. Add your egg and mix it up! Now time for your dry ingredients. Roll each scoop of cookie dough into sugar. Place onto a cookie sheet and time to bake. 9-11 minutes at 350 degrees F.
No kidding, my favorite cookie to date! Enjoy! 1. Preheat oven to 350 degrees F. Cream butter and sugars until light and fluffy. 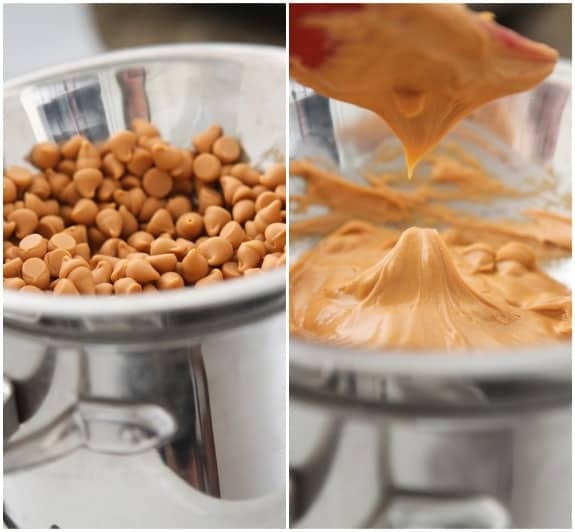 Melt butterscotch chips over a double boiler until melted. 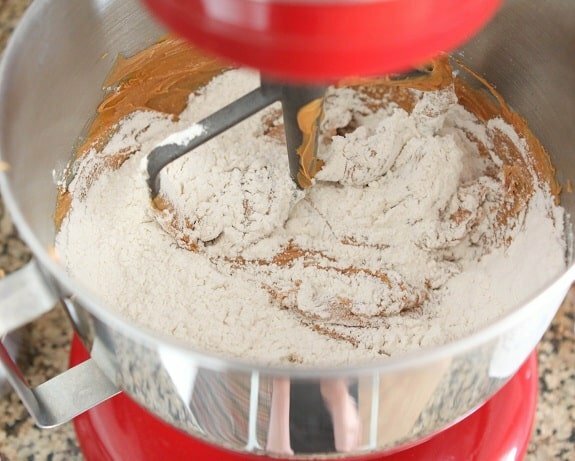 Add melted butterscotch chips and peanut butter to beaten butter and sugars. Beat in egg and vanilla. 2. Place flour, baking soda and salt in bowl; mix to combine. 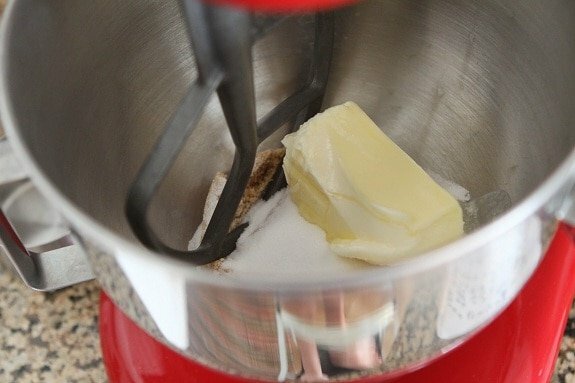 Add to wet ingredients until just combined then pour in butterscotch chips. 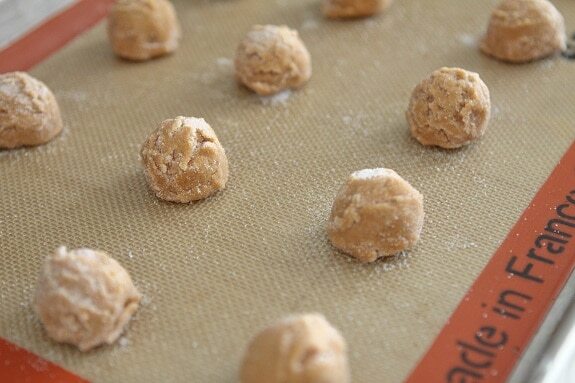 Using a cookie scoop, scoop dough, roll in sugar then place onto baking sheet. Press tops with tines of a fork if desired. I did it both ways and both are great. Bake for 9-11 minutes or until cookies are cooked through. Remove and let cool for 5 minutes before transferring to cooling rack. The cookies look fabulous, and I need to get myself to Spread, asap! Oh you need to go immediately Averie! I am half tempted to make a trip just to pick up a bunch of jars, so incredible!! Just saw your reply..if you come down here, please lmk! And if you want me to put anything in the mail for you, I totally will! You could use the butterscotch candy even though I haven’t seen butterscotch candy 🙂 Whatever you can find! I LOVE Spread!! Been ordering their products for years and really want to make a trip there. At any given time I have about 10 jars. Love it! Isn’t it the best Jessica?! I am tempted to order about 10 jars right now! Lol! 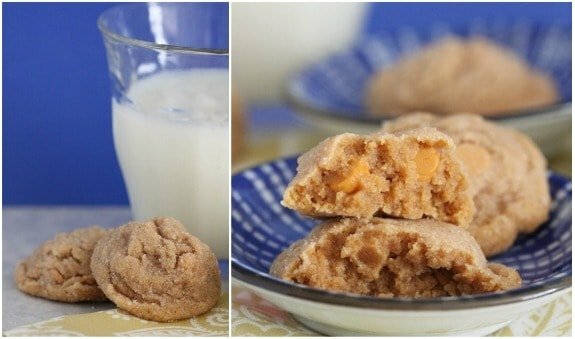 You incorporate 1 Cup of melted butterscotch chips into the recipe and all normal butterscotch chips too after you add the dry ingredients 🙂 It makes for one DELICIOUS cookie. Let me know if you have any other questions. I need to go to San Diego so I can visit that place! i love how fun and chewy those cookies look! delicious! I seriously NEED to try those spreads! THese look awesome. 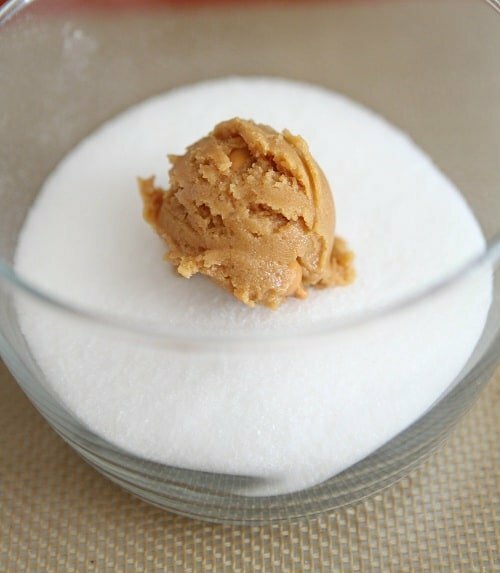 How can peanut butter + butterscotch + sugar be bad? These are on my list to make! These look so fluffy and wonderful! They look like little pillows! 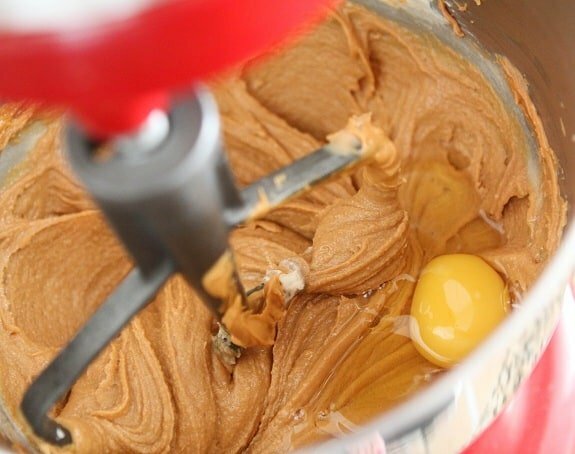 I love peanut butter/butterscotch combo…Can’t wait to try! Thanks! These look so soft and tasty. I usually hate making peanut butter cookies for some reason but these look great. Oooh we saw that place on the Food Network and clearly have been planning our pilgrimage ever since. 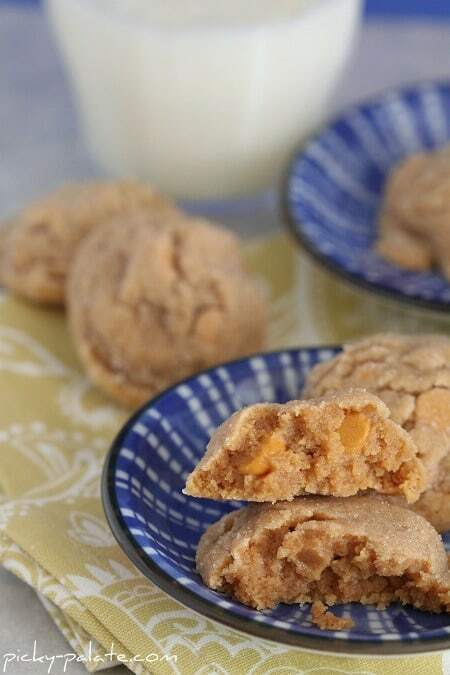 We love the idea of butterscotch and peanut butter…delicious! looking at that jar is making my mouth water. this recipe is genius! I need to be making this. 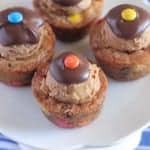 Oh my goodness … I think I have to make these today! A foot of snow outside and warm cookies coming from the oven – my boys are going to be in heaven! Those look great! In addition to the butterscotch chips you melt and add directly to the batter, did you add un-melted chips too? How much? Thanks! Oops! You’re right! I was looking “add whole butterscotch chips” in your instructions, and completely overlooked the list of ingredients. Thanks! Butterscotch and peanut butter seems like a great combination, Jenny! I read Amanda’s post about Spread the other day – thinking about ordering my sister some of their products for her birthday. She’s a peanut butter addict! oh yum! 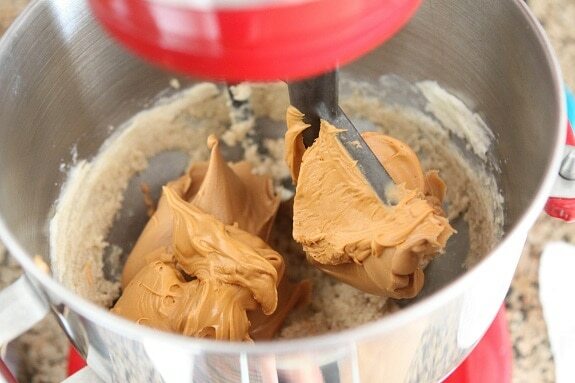 I might make these for the super bowl…the combination of butterscotch and peanut butter is heaven on earth! I’m going to make these today! But I’m waiting to see how much of the un-melted BS chips to add! YUM! YUM!! I love butterscotch chips! I’m off to buy some now! PLEASE stop with all these gorgeous cookie recipes–my thighs can’t take it! 🙂 Okay, going to mop up my drool . . .
Never been to San Diego so I am pretty jealous of your fancy peanut butter spreads. I love love love PB so its actually probably better if I don’t go there! Also never tried PB and Butterscotch, sounds like an awesome combo though…can’t wait to try these! 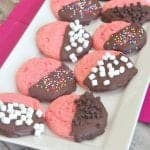 Love the cookies, they look like they will melt in your mouth! If u say they r your favorite then I have to give em a try! I would love to get my hands on that peanut butter yum! Thanks!! What amazing cookies and while I’m at work too! These seem so rich and wonderful and a very fine twist on an “expected” cookie. Thanks! Amanda, this is hysterical! Enjoy every one of those jars, they are like little tubs of gold! Peanut butter is my favorite and butterscotch too. I’ll have to try making this gluten free and try it with Spread! Now I’m hungry! Oh Jenny, you’re killing my “be good” efforts … and I thank you for it. I can’t wait to make a batch of these! I hope your week was fabulous! These are totally worth it, I promise :). Hope you enjoy! OMG! These sound amazing. Have you ever tried haystacks? I make a simplified version and all you need a 2:1 ratio of butterscotch chips to peanut butter. Melt in microwave keeping an eye to not burn. Then add chow mein noodles until coated to your liking. Put little stacks of them on a wax paper coated baking sheet to set in the fridge and TADA!! Everyone who tries them loves them and makes me bring them to every party. Plus they are so simple to make. Oh dang, you’ve done it again! I’m salivating at these flavors in this cookie! Feed me!!! Looks great! I can’t tell; are they chewy or crunchy? I am going to Spread ASAP =] those cookies look delish! 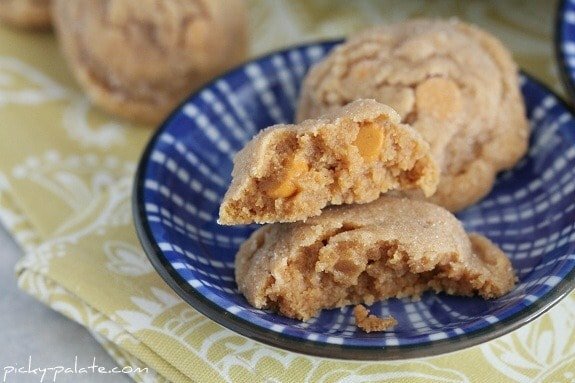 butterscotch and PB sounds like a Brilliant Combo! 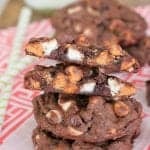 I made these cookies last night and they are AMAZING! I was thinking that next time I might add peanut butter chips as well! Very easy recipe, thank you for sharing as always! Looks great! If I wasn’t allergic to peanuts, I’d be all over this! Oh my, these look absolutely fantastic! So soft and chewy. I made these today for my husband to take to work tonight. They are having a going away party for a co-worker. We loved them. Thanks so much! We just made these tonight!!! YUMMO!!!! Thanks so much for sharing!!! For some reason, butterscotch has been calling my name even though I am not usually a fan! MUST BE THE PREGNANCY HORMONES!!! Literally salivating just looking at the pictures. My bookmarked, Cooking/Recipes, section is growing by leaps and bounds. My hips will, too. Thanks for sharing. I could go for a bowl of that cookie dough! Have a great weekend, Jenny! Just got done baking these, they were a HUGE hit! Thanks for another great recipe!